Sea Installer arriving for delivery from Qidong in China where it was constructed at Cosco Shipyard. The main crane, a Gusto GLC-800-ED, is capable of revolving 360 degrees around the jack-up leg. Sea Installer installed two Siemens 6MW wind turbines for the Gunfleet Sands III offshore wind power plant as its first assignment. A night view of the Installation process of two Siemens 6MW wind turbines at Gunfleet Sands III offshore wind power plant. Sea Installer is a self-lifting jack-up vessel built by Cosco Shipyard Group at its shipyard in Qidong, China. It was built for A2SEA, a Danish company owned by Dong Energy (51%) and Siemens (49%). The specially designed offshore wind turbine installation vessel was ordered by A2SEA in 2010 and delivered in December 2012. A2SEA invested $139m into the construction of the vessel, which is capable of installing wind turbines at water depths ranging from 6.5m to 45m. The company has also placed an order with Cosco Shipyard for the construction of a sister vessel, with an investment of $155m (kr 890m). The sister vessel NB 002 is scheduled to be delivered in 2014. "The total deck load capacity of the vessel is approximately 5,000t, which is equivalent to transporting up to ten wind turbines simultaneously." The long legs of Sea Installer enables her to operate in harsh offshore conditions and in deeper waters. They measure approximately 83m. The higher transit speed of the vessel enhances operational efficiency. 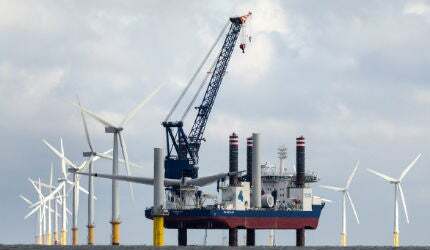 The vessel installed two Siemens 6MW wind turbines for the Gunfleet Sands III Offshore Wind Power Plant as its first assignment in January. She then served Dong Energy in the installation of wind turbine generators (WTGs) at Anholt Offshore Wind Farm from February to April. Sea Installer was the fifth vessel operating at the Anholt project in A2SEA’s fleet. The others were Sea Power, Sea Worker, Sea Jack and Sea Energy. Sea Installer plans to operate at the West of Duddon Sands Offshore Wind Farm from April to mid-2014. "The vessel is capable of installing rotor blades separately or the whole rotor with pre-mounted blades." The wind turbine installation vessel measures 132m in length, 39m in breadth and has a draft of 5.3m. The deck load is 15t, with a loading area of 3,350m². The total deck load capacity is approximately 5,000t, which is equivalent to transporting up to ten wind turbines simultaneously. The vessel has a maximum service speed of 12kts. Sea Installer is equipped with a double hydraulic jacking system with four cylindrical hydraulic leg lifting systems. The spudcan footprint of the jacking system is 105m² and the jacking speed is 0.5m per minute. The vessel is capable of installing rotor blades separately or the whole rotor with pre-mounted blades. The vessel has the capacity to hold 1,000m³ of fuel, 450m³ of fresh water and 300m³ of sewage. She can accommodate 35 regular crew members in 35 single cabins. The vessel is also capable of accommodating 60 people altogether during installations. Other facilities onboard include two offices comprising of six desks, a rest lounge, a canteen and a fitness room. The main crane aboard the vessel is a Gusto GLC-800-ED type with a main boom length of 94m, a maximum lifting capacity of 800t and an outreach of 24m. The crane is capable of revolving 360° around the jack-up leg. The vessel is also equipped with five cargo cranes with a maximum lifting capacity of 20t and a main boom length of 25m. Sea Installer is driven by three Voith Schneider Propellers (VSP’s) with an output of 3,800kW each. The propellers are Voith Inline Thrusters (VIT) 2300 -1500. The vessel is powered by six MaK diesel engines with a power output of 3,020kW each. She is also equipped with an all-electric propulsion system and a DP-2 dynamic positioning system. The automation system aboard the vessel is the SHISHIP IMAC integrated control system supplied by Siemens. The system performs monitoring, alarm and control functions for the electrical equipment. Siemens also supplied the diesel electric drive unit including the main generators and distribution transformers for the onboard medium voltage distribution system. Beluga Shipping and Hochtief Construction formed a joint venture named Beluga Hochtief Offshore in April 2010 to develop a specially designed heavy-lift jack-up vessel. The GMS Endurance is a self-propelled, self-elevating jack-up barge built by Gulf Marine Services in Mussafah, Abu Dhabi, UAE.